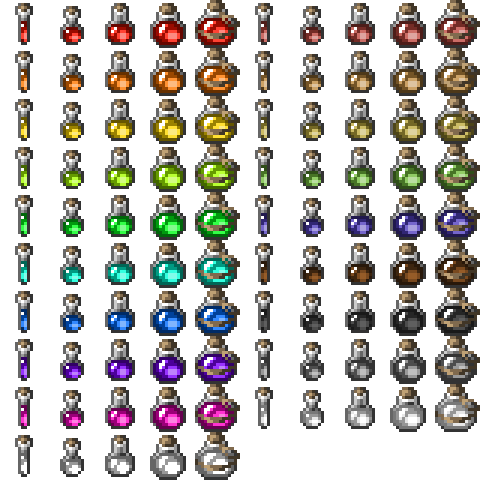 I wanted to see if it's possible to make even better potions than my my first ones. It appears it is, heh. :) But i don't really think the first ones are worse - actually it's just another style. These here are more shiny, are in a different angle (really orthographic now) and have some depth, indicating that there actually is something liquid inside and not colorful sand or something. 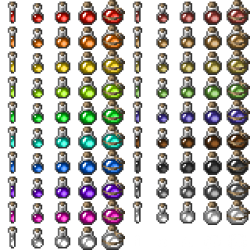 5 qualities á 18 colors and in the last row there are transparent potions with an overlay for easy recoloring (thanks again Borka223, who contributed the equivalent of my first potions). Check out my interior tileset as i finished it the last few days, too! Can I use them in my RPG game?